What is higher craftsmanship than high-end furniture? Bench-made furniture is true master-crafted furniture and cabinetry, literally made on a workbench by the hands of a single craftsman… And this is exactly what The Furniture Guild produces. It’s all in the name: The Furniture Guild was inspired by the medieval guild system where an aspiring craftsman apprentices himself to a mastercraftsman and over the course of years learns everything the master knew. This quest for the best, in part explains the name The Furniture Guild. The other comes from the Johnson family’s deep respect for craftsman and their desire to create a workplace where each and every person felt their importance. The word guild refers to the European guild system which began in the middle ages and continued through the renaissance until guilds were supplanted by industry. Guilds were brotherhoods of workers where trade secrets were taught to a dedicated apprentice by a master craftsman. This careful and deserving tutelage is what takes place today. The social component of this business is too important to overlook. Johnson explains, “Here we empower our people. Each person signs and dates each piece and takes pride in the work they have done. This is a big part of our quality. We take the time to do things the right way.” The Furniture Guild is as much about people as they are about materials and techniques. And speaking of materials…The Furniture Guild searches for the highest grade materials. They use PureBond® hardwood plywood made with formaldehyde-free technology. The board from China tends to off-gas a large amount of formaldehyde and when cutting into a board you are sure to find voids in the layers. PureBond® is a better panel not only because it is no-added formaldehyde, but because it is consistent, stable and flat. The Furniture Guild is also very fond of Lyptus® because it is a fast growing South American species that looks a bit like mahogany without the same environmental impact. Bamboo is another favorite because it is fashionable as well as sustainable. They also use FSC® certified lumber when clients specify it as well as CARB-compliant materials. 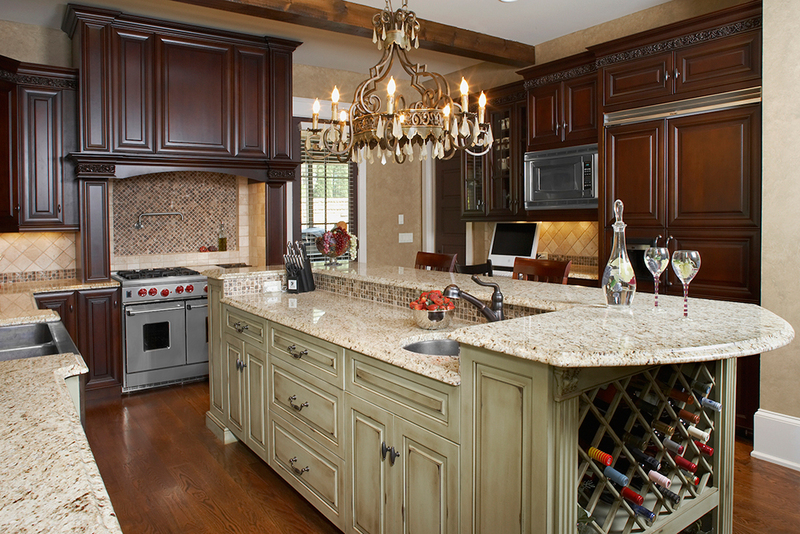 The Furniture Guild sells their high-end cabinetry lines through an extensive, national network of dealers. Just like the historic guilds, we expect The Furniture Guild to be producing top of the line furniture and cabinetry well into the future.